pul enRu ozhin dhana kol – have they become deserted (such that grass has grown tall)? E pAvam – Oh, how sad! kallum – AzhwAr refers to thirumalai as kal (stone). Is it correct to refer to thirumalai as kal? The relationship between AzhwArs and emperumAn is such that they would refer to thirumalai as kal, thiruvananthAzhwAn (AdhiSeshan) as tham pAmbu (his snake) (as in nAchchiyAr thirumozhi 10-3), and in verses such as mANiyAy maNNaLandhAy (measured the worlds as a bachelor), they refer to emperumAn as a bachelor. kallum kanai kadalum vaigundha vAnAdum pul enRu ozhindhana kol EpAvam – emperumAn does not appear to believe that there are certain divine locations such as thirumalai or that there is a vyUha location such as thiruppARkadal or that there is a paramapadham and that he has inclination towards these locations. pul enRu ozhindhana kol – When looking at the way he [emperumAn] is engaged with my heart, it appears that those locations have become bushes (due to non-inhabitation). We could also consider the meaning of this to be – these divine dwelling places have become insignificant after emperumAn entered AzhwAr’s heart. periyavAchchAn piLLai, the commentator for this prabandham says that the attitude of AzhwAr while saying this is similar to the attitude of the girls who married the sage saubhari. The reference is to a narration regarding a sage saubhari who took fifty human forms to marry fifty daughters of a king and lived in a palace with each of the fifty daughters. When the king went around his daughters’ palaces to check if they had any grievance, all of them said the same line “I have no problem, but my husband does not go to any other sister’s house”. In the same way AzhwAr says that emperumAn has forgotten all other residences and is dwelling only in his heart. EpAvam – this appears to be the result of some sin; however, since there is no sin in this, we can consider this to be an expression of wonder. 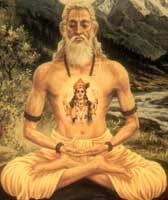 vella nediyAn – being great in the quality of boundlessness, he cannot be defeated by anyone. Alternatively, the term vella could be taken to mean “very” (a lot) and thus the meaning of vella nediyAn could be taken to mean that emperumAn is one who is very great and there is none who is greater than he. Here, the term greatness refers to the greatness of his qualities. niRam kariyAn – even if he does not have qualities, he cannot be given up due to the beauty of his form. uLpugundhu nIngAn adiyEnadhu uLLaththu agam – entering my heart, he does not appear to consider leaving it. The opinion is that emperumAn appears to think that if he were to leave AzhwAr’s heart, then AzhwAr cannot sustain himself. We will take up the 69th pAsuram next. This entry was posted in iyaRpA, periya thiruvandhAdhi on January 19, 2019 by T N Krishnan.